This is the Baobab tree that lives in the beautiful garden of the traditional Kivulini house I stayed at this summer in coastal Kenya. The Baobab is the absolutely biggest tree species in Africa that reaches heights between 20 and 30 meters. The Baobab is highly regarded by African people and is the subject of many lore. It is known as the ‘upside down’ tree for its unusual shape. Some lore say this is because when God planted the Baobab tree, it kept walking, so God pulled it up and replanted it upside down to stop it from moving. Other lore say that when God made the world he gave each animal a tree. The Baobab was given to the hyena, a careless and ugly creature, who planted it upside down. But I choose to believe the lore which says that the Baobab fell from the sky. That’s why it’s upside down. This ancient lore refers to the beginning of all times, when the Creator was putting final touches on Earth and was choosing pretty plants from the Paradise. The Creator didn’t like the ugly Baobab tree and threw it out over the wall of Paradise (down to Earth below). Looking down on the Earth, the Creator saw that the Baobab landed in Africa. It continued to live and grow with its branches embedded in the hot soil and its roots rising towards the sky. It lived for thousands of years and became one of the oldest living beings on Earth (which is still true today!). The Baobab is considered a gift from the gods by many African people, for its amazing properties providing shelter, medicine, food and water. Its young leaves can be cooked or eaten raw like spinach. The leaves are also used in traditional herbal medicine to treat various illnesses. Dried into a powder, they are added to soups and stews as a thickener, or used as a flavoring in local cooking. The Baobab tree has an extraordinary capacity to store water in its bark and trunk during the rainy season, giving fruit later on in the year, when everything around them is dry and barren. 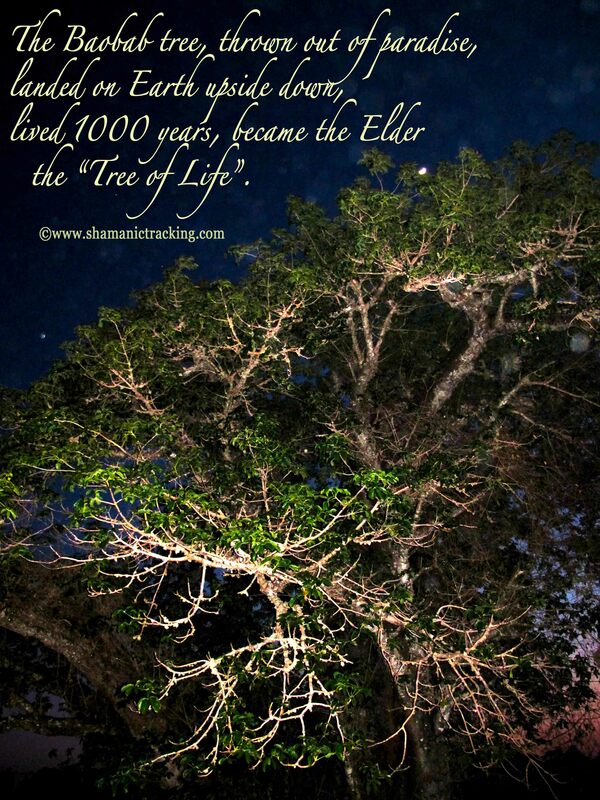 This is why it is known as the ‘Tree of Life’. Its fruit is almost fifty percent fibre and has one of the highest antioxidant capacities of any fruit in the world. It also dries naturally on the branch unlike any other fruit. The pulp of the dry fruit is mixed with water and used as a beverage similar to lemonade. The seeds are traditionally pounded into meal or ground to make coffee. They are also pressed into oil and then used to treat both skin and hair. The bark of the tree is fire resistant, and is used to make ropes and clothing. The older trees are usually hollow and serve as storage, shelter and even burial grounds. The local people of Coastal Kenya are very proud of their Baobab trees and would go out of their way to show you one. We walked with them all the way to where the (Kongo) river meets the Ocean. (I really felt bad to tell them that we had one in our garden…). We were encouraged to try and hug the tree, which made us all laugh – the tree trunk is usually about 10 to 25 meters wide. We also tried its famous ‘monkey-bread’ fruit which I have to say tastes special, i.e. I think it takes time to learn to appreciate it 🙂 . One late evening I was sitting below our Baobab tree watching the Moon and the Stars shine brighter in the clear skies as the Sun sat down. I was pondering the history of the region, of the ‘Tree of Life’ and called on the ancestors of the land to honor them. This is when I noticed very many orbs in and around the tree, some of which you may see in the photograph. The Tree of Life not only feeds and shelters the living, but also the nature spirits, as well as the souls of those who have become before us and those who will come after us. p.s. Doing some research for this post, I discovered a beautiful book called Tree of Life: The World of the African Baobab by Barbara Bash. And I learnt about Wangari Maathai, Nobel Prize Winner, the environmental and political activist known for rebuilding the forests in Kenya. This entry was posted in Africa, connecting, conservation, Earth Day, nature, planet, quote, shamanism, spirit, travel and tagged Africa, ancestors, ancient lore, earth, forest, Kenya, life, planet, plants, sacred, spirit, tree, tree hug. Bookmark the permalink. So rich in fascinating information, thank you! I learned so much about this powerful tree with a delightful name and incredible legacy. The fact that it has so many life giving properties is mind blowing! What a fascinating read friend. I haven’t been notified of your post so I subscribed again. Love to hear more on your sojourn to Africa. Thanks for the lesson. I’d never known about the Baobab — they get vey old… wow; eh!